Galaxy Capital Limited, the investment subsidiary of the Galaxy Group is in a good position to meet the stated capital requirement to be announced by the Securities and Exchange Commission (SEC). Chief Executive Officer of Galaxy Capital, Samuel Bright-Kaitoo applauded the SEC for the recapitalization move, noting that the resultant mergers and acquisitions would be good to safeguard stakeholder investments and retain confidence Ghana’s economy. “We are in anticipation and I believe it will be good for the economy. It has happened in the banking sector so we the players in the sector are expecting it” he added. Samuel Bright-Kaitoo’s comment comes after the BoG raised the minimum capital of banks to GHS400 million and the SEC has indicated its intention to do likewise. Commercial banks in the country have up to December, 2018 to raise the amount aimed at ensuring that institutions are well capitalized to operate in the sector. Speaking at the maiden Annual General Meeting (AGM) of Galaxy Money Market Fund Limited by managed by Galaxy Capital, Samuel Bright-Kaitoo revealed that they have put in place adequate measures to meet the requirement to enable them serve their clients better. He noted that, consolidating will enable market operators provide better services and be better positioned to address the needs of the clients and expand as well. Mr. Samuel Bright-Kaitoo said as the economy was rebounding, the investment sector needed to be well positioned to support the growth potential of the economy. The Galaxy Capital boss added that, it is the responsibility of the SEC as regulator to ensure a resilient investment industry system to protect the safety and soundness of the financial system. Also, Board Chairperson, Lucy Odoom revealed that the fund posted very good returns despite the downfall of government’s short-term securities during the year. 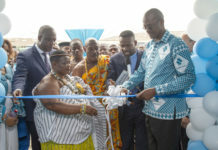 “The fund adopted superior investment strategies to close the year at a price of GH?0.5880 from its Initial Public Offer (IPO) price of GHC0.50 in May 2016 representing a year to date return of 17.6 percent,” she added. Mrs. Odoom also revealed the Galaxy Money Market fund outperformed its benchmark portfolio that indexed government 91-day Treasury Bill which returned 14.90 percent over the same period. In the short term, she said they hope to retain shareholders and encourage them to top up their investments. “Over the medium to long-term, we seek to embark on a massive fund mobilization drive through investor education and awareness both in the formal and informal sectors as well as institutional and individual clientele,” she said. Mrs. Odoom was confident they will deliver solid performance in 2017 and beyond with support from shareholders.